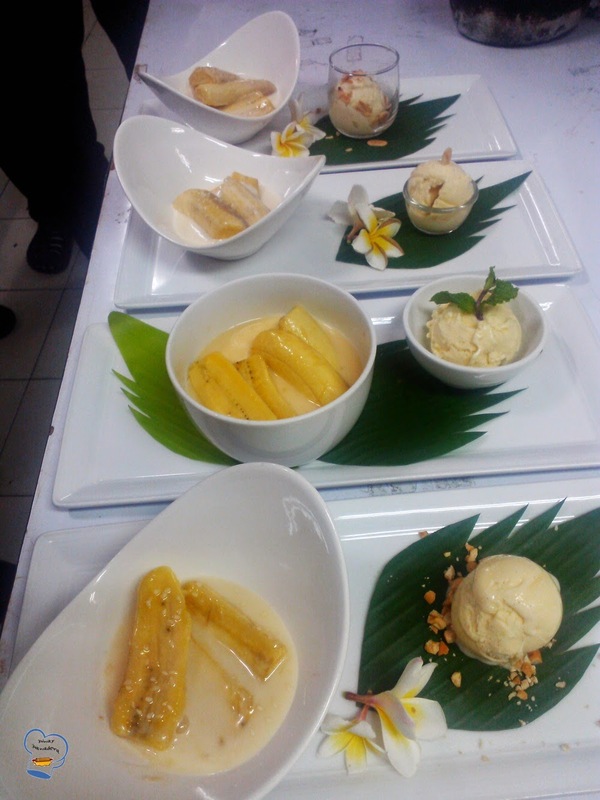 I had the privilege to witness the kitchen staff's hands-on training for one of the most popular Thai desserts. Kluai buat chi or bananas in coconut milk is fuss-free recipe but tastes great. You simply cook not-so-ripe bananas in sweetened coconut milk and Voila - you get a satisfying treat! Anyway, the staff were grouped in three teams, with four people in each. The executive chef demonstrated cooking techniques. When he finished cooking, he ladled the bananas into a bowl and decorated the plate for presentation.The dessert was laid on a banana leaf. It was served with a scoopful of vanilla ice cream on the side. Once the chef presented his plated dessert, each team went to its respective work stations to recreate the recipe. Funny how the groups came up with different plating decoration ideas. 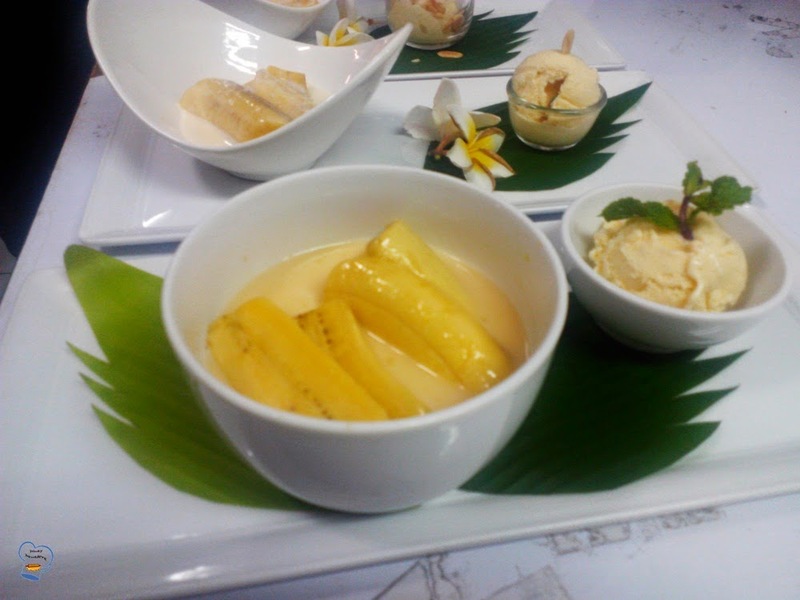 The sample dessert was four pieces of bananas sliced lengthwise in creamy coconut milk. The vanilla ice cream garnished with roasted chopped peanuts was on the side. Team A had more slices of bananas in their bowl. The sauce was thin and sweet. They served vanilla ice cream on a small bowl and topped it with mint. Some of Team B's bananas were overripe. I commented that the ones they used were great for banana bread. The team's leader defended their work saying they deliberately used over-ripe bananas so they wouldn't go to waste. Good thinking but it ruined the overall taste. The sauce made it up for it though. It had a tiny hint of saltiness which I prefer in most desserts cooked in coconut milk. They opted to serve the ice cream in a clear glass and garnished it with sliced almonds. Team C's was too sweet. One bite was all I needed. The dish they served the ice cream in was too small. And the garnish was just one sliced almonds sticking on top. It was interesting to see how different teams used their imagination to create a perfect restaurant style dessert. Each of them have weak points. 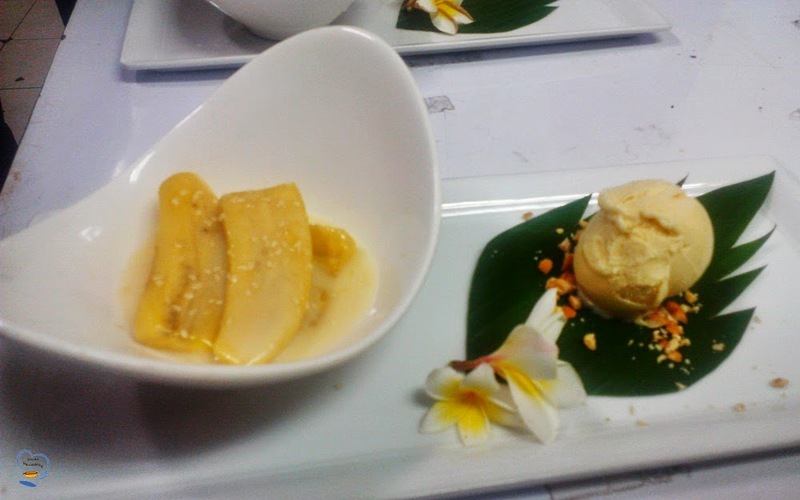 Time will come when plating kluai buat chi dessert will not be as tricky.